Արքայազնը կնքվել է 1864 թվականի մարտի 19-ին «Ալբերտ Վիկտոր Քրիստիան Էդուարդ» անվամբ (այդ անունները նույնպես Վիկտորիա թագուհին էր ընտրել) Բուքինգհեմյան պալատի մասնավոր մատուռում` Քենթերբերի արքեպիսկոպոս Չարլզ Լոնգլիի ձեռամբ։ Մկրտության կնքահայրերն ու կնքամայրերն են եղել. 1883 թվականից սկսած եղբայրներն անցել են անջատ ուսուցման։ Գեորգը մնաց նավատորմում, իսկ Էդին ընդունվեց Քեմբրիջի համալսարանի Երրորդության քոլեջ: Դալթոնի, ֆրանսիացի հրահանգիչ Խուայի և նոր կրկնուսույց-ընկերակից Ջեյմս Քենեթ Սթիվենի (անգլ.՝ James Kenneth Stephen) ուղեկցությամբ քոլեջ ուղևորվելուց առաջ արքայազնը կանգ է առնում Սանդրինգհեմի քոթեջներից մեկում, որտեղ անցնում է արագացված նախապատրաստական ուսուցում: Որոշ կենսագիրներ կարծում են, որ Սթիվենը կնատյաց է եղել (միզոգինի՛ա) (չնայած նրան, որ այս փաստը կասկածի տակ է դրվում) և հավանաբար չափազանց հուզական կապվածություն է ունեցել արքայազնի նկատմամբ, բայց արդյոք նրա զգացմունքները հոմոսեքսուալ բնույթ են կրել, թե` ոչ, պարզ չէ։ Սթիվենն ի սկզբանե լավատեսորեն էր տրամադրված Էդիի հետ պարապմունքներին, սակայն արքայազնի քոլեջ մեկնելուց հետո եկել է հետեւյալ եզրակացության. Սոմերսեթի քույրը` լեդի Ուոլտերֆոլդը հերքել է, որ իր եղբայրը Ալբերտ Վիկտորի մասին ինչ-որ բան է իմացել։ Նա գրել է.- «Վստահ եմ, որ տղան գծի նման ուղիղ է... Արթուրը չգիտեր, թե ինչպես կամ որտեղ է տղան անցկացնում իր ժամանակը... նա կարծում է, որ տղան բոլորովին անմեղ է»: Սակայն լեդի Ուոտերֆորդը եղբոր անմեղությանն էլ չէր կասկածում: Սոմերսեթն իր ընկերոջ` Լորդ Իշերի հետ անձնական նամակագրության մեջ հերքել է, թե անձամբ արքայազնի մասին որևէ բան գիտի, բայց հաստատել է, որ լսել է խոսակցություններ, և հույս ուներ, որ դրանք կօգնեն իր դեմ եղած ցանկացած մեղադրանք հերքելուն։ Նա գրել է.
Լինելով միապետի արական գծով թոռը, ծննդյան օրվանից և մինչև 1890 թվականի մայիսի 24-ը արքայազնը մեծարվել է Ձերդ Արքայական մեծություն Ուելսի արքայազն Ալբերտ Վիկտոր։ 1890 թվականի մայիսից մինչև 1892 թվականի հունվարի 14-ը Ալբերտ Վիկտորը մեծարվել է Ձերդ Արքայական մեծություն Կլարենսի եւ Էվոնդեյլի դուքս, սակայն նրա թաղմանը հնչել է. «գերագույն, հզոր ու փառավոր Ալբերտ Վիկտոր Քրիստիան Էդուարդ արքայազն, Կլարենսի եւ Էվոնդեյլի դուքս, Աթլոնի կոմս, Սաքսոնի դուքս, Սաքսեն Կոբուրգ և Գոթայի արքայազն, ազնվական Կապիչի շքանշանի ասպետ, Սուրբ Պատրիկի փառապանծ շքանշանի ասպետ». ↑ Բացի այդ, թագուհին հայտարարել է, որ այդուհետ միապետության գոյության ողջ ընթացքում ծնված բոլոր թագավորական որդիների անուններից մեկը պետք է լինի «Ալբերտ», իսկ դուստրերի անուններից մեկը` «Վիկտորիա». ↑ Առաջին անգամ Արքայազնի լսողության խնդիրների մասին առաջինը լրջորեն խոսել է թագուհու անձնական քարտուղար Հենրի Պոնսոբնին, երբ մի անգամ մտքերի մեջ մտասուզված քսանամյա Էդիին կանչել է և նա չի լսել իրեն։ Սակայն այդ մասին խոսակցություններ ավելի վաղ էլ են եղել։ Այնուամենայնիվ, արքայազնի հիվանդության այլ ապացույցներ չեն եղել. ↑ Lord Chamberlain’s Office, March 11, 1864(անգլ.) // The London Gazette. — 1864. — № 22832. — С. 1535. ↑ Christopher Hitchens How’s the vampire?(անգլ.) // London Review of Books : magazine. — 1990. — Т. 12. — № 21. — С. 12. — ISSN 0260-9592. 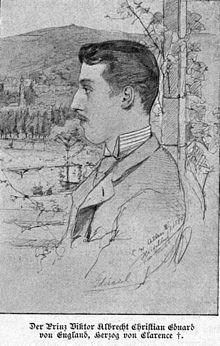 ↑ Euan McLelland Jack The Ripper suspect Prince Albert Victor is revealed to have been suffering from gonorrhoea – most likely caught from a prostitute(անգլ.) // Daily Mail. — 2016. ↑ Andrew Cook The King Who Never Was(անգլ.) // History Today. — 2005. — Т. 55. — № 11. — ISSN 0018-2753. ↑ Notes on Current Topics(անգլ.) // The Cardiff Times : newspaper. — 1889. — С. 5. ↑ Philip Howard Victorian Scandal Revealed(անգլ.) // The Times. — 1975. — № 59341. — С. 1. — ISSN 0140-0460. ↑ The Cleveland Street Scandal(անգլ.) // The Press (Canterbury, New Zealand). — 1890. — Т. XLVII. — № 74518. — С. 6. ↑ Newyddion Tramor(վալլ.) // Y Drych. — 1890. ↑ Albert Victor Hissed: Frenchmen Express Disapproval Of The English Prince(անգլ.) // Chicago Tribune. — 1890. — С. 2. — ISSN 1085-6706. ↑ 86,0 86,1 Peter Day, John Ungoed-Thomas Royal cover-up of illegitimate son revealed(անգլ.) // The Sunday Times. — 2005. ↑ Letters to the King: Haddon bound over(անգլ.) // The Times. — 1934. — № 46657. — С. 7. — ISSN 0140-0460. ↑ The Suicide A Chorus Girl In London(անգլ.) // Manchester Courier and Lancashire General Advertiser. — 1891. — С. 5. ↑ The Prince and the Chorus Girl(անգլ.) // New Zealand Herald. — 1891. — Т. XXVIII. — № 8724. — С. 2. ↑ The Romantic Suicide of a Chorus Girl(անգլ.) // The Daily News. — 1891. — С. 3. ↑ Adventures Of A Gaiety Girl(անգլ.) // Auckland Star. — 1900. — Т. XXXI. — № 83. — С. 13. ↑ Richard Alleyne History of royal scandals(անգլ.) // The Daily Telegraph. — 2007. ↑ The Death of the Duke of Clarence: Description of His Last Hours(անգլ.) // The Times. — 1892. — № 33535. — С. 9. — ISSN 0140-0460. ↑ Mark Roskill Alfred Gilbert's Monument to the Duke of Clarence: A Study in the Sources of Later Victorian Sculpture(անգլ.) // The Burlington Magazine. — 1968. — Т. 110. — № 789. — С. 699–704. ↑ Our London Letter(անգլ.) // Ballinrobe Chronicle (Ireland). — 1892. ↑ Who Was Jack the Ripper? ↑ Andrew Cook The King Who Never Was (англ. ↑ Thomas E. A. Stowell Jack the Ripper – A Solution? ↑ Peter Dickinson Skeleton-in-waiting. — Bodley Head, 1989. — 154 p.
↑ Lord Chamberlain’s Office, February 4, 1892(անգլ.) // The London Gazette. — 1892. — № 26254. — С. 603. ↑ War Office, Pall Mall (англ. ↑ Георгий Вилинбахов, Михаил Медведев Геральдический альбом. Лист 2 (рус.) // Вокруг света : журнал. - 1990. - 1 апреля (№ 4 (2595)). Cokayne, G.E. ; Gibbs, Vicary; Doubleday, H. A. 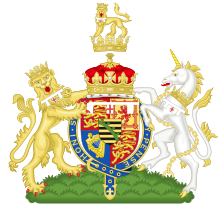 The Complete Peerage of England, Scotland, Ireland, Great Britain and the United Kingdom, Extant, Extinct or Dormant. — London: St. Catherine's Press, 1913. — Т. III. Hyde, Harford Montgomery The other love: an historical and contemporary survey of homosexuality in Britain. — London: Heinemann, 1970. — 323 p.
Hyde, Harford Montgomery The Cleveland street scandal. — Coward, McCann & Geoghegan, 1976. — 266 p.
Martin, Theodore Queen Victoria as I Knew Her. — William Blackwood & Sons, 1908. — 157 p.
Nicolson, Harold King George the Fifth: His Life and Reign. — London: Constable, 1952. — 570 p.
Pope-Hennessy, James Queen Mary: 1876 - 1953. — London: George Allen and Unwin, 1959. — 685 p.
Van der Kiste, John Albert Victor, Prince, duke of Clarence and Avondale (1864–1892) // Oxford Dictionary of National Biography. — Oxford University Press, 2004.